Established in 1990, we’re based in Cheadle, Stoke-on-Trent. Our clients and their projects are diverse in size and location. The skills and ingenuity we offer will turn your ideas into reality. We know that things will change as your project unfolds so we take a flexible approach with the key aim of meeting your needs. We have the facility and capabilities to provide a full service from design through to making. We deliver small and large scale projects to suit your budget. Contact us. Tell us about your project and find out how we can help. Want to see what we’ve done? Browse through our portfolio. "Frequent bursts of applause during opening night of Willy Russell's clever play indicated just how much the audience were enjoying this production by the Lichfield Garrick Rep Company. The film version starring Julie Walters and Michael Caine was a hit, telling the heart-warming story of how working class Liverpool hairdresser Rita decides she wants more out of life and enrols for an Open University course on literary appreciation. 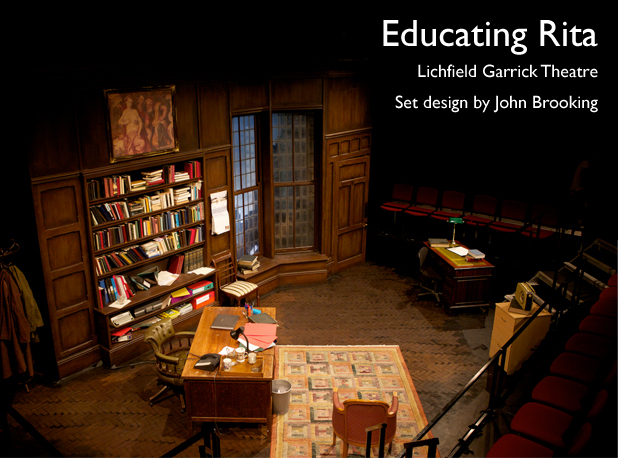 It loses nothing of its impact in the intimate atmosphere of the Garrick studio, where John Brooking's impressively designed set, representing Professor Frank Bryant's oak-panelled study on the first floor of a Victorian-built university, is simply ideal." "Tupele Dorgu, known to millions as the mouthy factory worker Kelly Crabtree in Coronation Street, gives an outstanding performance as hairdresser-turned-undergraduate Rita. Tom Roberts, as Rita’s tortured tutor Frank provides the perfect verbal sparring partner as the pair argue about literature, love, ambition and life in general. John Brooking’s convincing set provides the ideal backdrop for them to play out their uneasy relationship. In fact, as you enter the theatre, you feel you really are entering Frank’s world centred on his stuffy study, with its oak panels, leaded sash windows and bookshelves that only vaguely disguise the tutor’s secret whisky bottles. Under Gareth Tudor Price’s sure-footed direction, this two-hander is a joy from start to finish and another resounding hit for the Garrick Rep Company." © 2010 John Brooking Ltd.